News outlets cannot cover everything, so priority is given to stories considered relevant to their perceived audiences. In the case of US media, decisions on where and what to report around the world are often based on relevance to US interests — economic, humanitarian or security. Pakistan often falls into all three. Ever since US forces went into landlocked Afghanistan 16 years ago, neighboring Pakistan has been a key logistic ally in the war. Before 2001, Pakistan was a relatively peaceful country with an almost non-existent record of militant violence. But since 2001, over 50,000 people have lost their lives to militants attacks in Pakistan. The country continues to face multiple internal and external attacks. Given the law and order situation, a lot of media coverage both inside and outside the country focuses on conflict, which made me, the Global Voices Pakistan editor, wonder: How does our Pakistan coverage compare to that of American and English-language Pakistani news organizations? In order to try to answer this question we used Media Cloud, an open-source content analysis tool that aims to map news coverage of current events. As part of the NewsFrames project we have partnered with MIT Center for Civic Media and the Harvard Berkman Klein Center for Internet and Society to use Media Cloud for our analysis. We searched for news stories published between January 30, 2016, and June 26, 2017* that contained sentences with the word “Pakistan” for three different sets: US news outlets, Pakistan-based English-language news outlets, and Global Voices. The goal was to see samples of the most frequent keywords, and the articles related to them, in coverage of Pakistan (more on how we use Media Cloud is here). 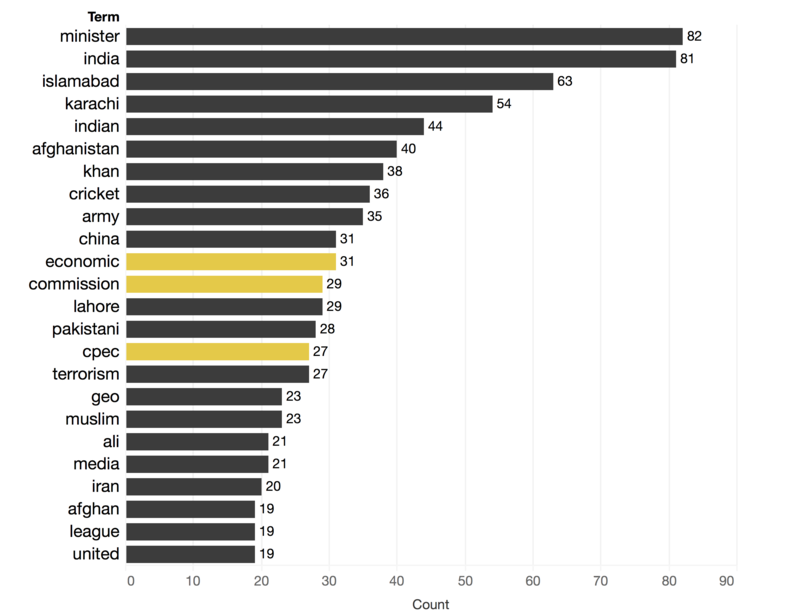 According to our analysis, mentions of “Afghanistan” and “India” alongside “Pakistan” clearly dominated news coverage across all three media environments. If you set these keywords aside, however, the Media Cloud results show distinct editorial priorities at work: In English-language Pakistani media, politics and economics got the most coverage. And while coverage from both US media and Global Voices focused on security, the two differed in how such stories were framed. The analysis reveals that overall US media coverage of Pakistan focused on the security issues like the Taliban, an insurgency in one of its largest provinces, Baluchistan, and attacks by various militant groups. “Azhar” could refer to two different people: Maulana Mehmood Azhar, founder and leader of the UN-designated terrorist group Jaish-e-Mohammed; and Azhar Ali, an opening batsman for the Pakistan cricket team. When analyzing “cricket” further, “Azhar Ali” turned up as one of the most prominent words used in reports from both English-language Pakistani media and US-oriented media. The most popular words that showed up when analyzing how English-language Pakistani media covered Pakistan were “economic,” “cpec,” and “commission,” references to some of Pakistan’s most pressing political issues. There was a lot of conversation around “economic” development given the collection of infrastructure projects, worth $62 billion, currently being pursued under the China Pakistan Economic Corridor (CPEC). The words “Panama” and “commission” refer to the judicial commission that has been formed to investigate finances of the prime minister and his family after the Panama Papers revealed their offshore accounts. Analyzing “commission” further reveals just how extensively English-language Pakistani media covered this story. While the country’s security situation featured in Global Voices coverage of Pakistan, stories tended to highlight the people affected by violence. Coverage also profiled other individual efforts: activists and their campaigns, and writers and change makers who are working on various issues hoping to shed light on the diversity of Pakistan. Global Voices’ Pakistan coverage lacked consistent reporting on a country that is widely reported by other media outlets. Yet, while acknowledging a feeling of missed opportunities, it affirms our understanding that we aren't trying to keep up with the fast-paced news cycle. Another contrast in coverage is cricket. Cricket is a massively popular sport in Pakistan and it usually dominates local news coverage and social media feeds. While Global Voices covers some aspects of sports from time to time, we don’t do daily coverage of sports issues. An example that illustrates this difference in how US media and Global Voices frame security issues is Pakistan-India skirmishes in September and October 2016 after an attack by armed militants in the town of Uri in the Indian-administered state of Jammu and Kashmir. Following the attack, India canceled its participation in the 19th SAARC summit to be held in November in Islamabad, Pakistan. Kashmir has always been a source of conflict for both countries and the attack triggered a diplomatic crisis. US media outlets like CNN published analysis like “Could India and Pakistan Go to War?” GV’s coverage, on the other hand, highlighted voices for peace from both sides (“As Politicians Beat the Drums of War, Ordinary Indians and Pakistanis Call for Peace”) and the effect of heightened tensions and curfew in Kashmir on ordinary people. When I first started as Pakistan editor for Global Voices, I wanted to strengthen our focus on underreported or unexplored issues. I felt that Pakistan with all its complexity and diversity is too often painted with a broad brush, and that violence is reported in terms of numbers and not the actual humans behind these numbers. 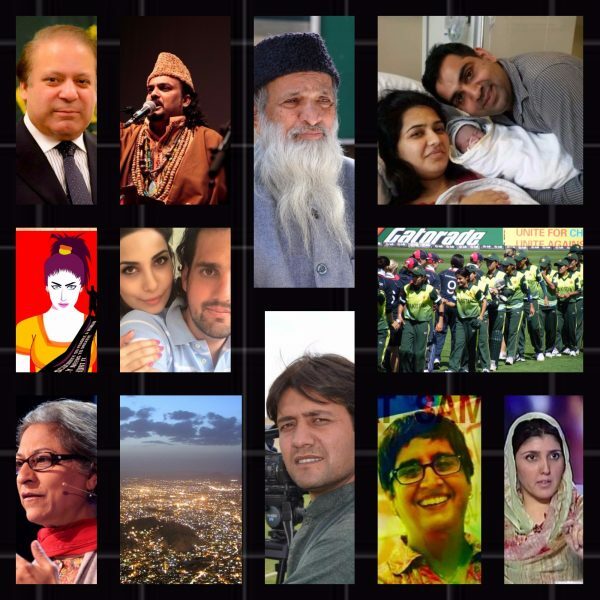 Based on the results of the analysis above, I have come to the conclusion that most of GV’s Pakistan stories covered the same stories as mainstream media in Pakistan and the US, but from an angle that prioritized the voices of ordinary people and the efforts of those seeking to look past jingoism and build bridges. This extended to our process of reporting stories too. I am reminded of the number of times we had conversations with our Indian authors and our South Asia regional editor Rezwan about how we can shape our coverage, an exercise that helped us reflect on our inherent biases. Moving forward in the coming year, I would like to continue our cross-regional collaborations. I also feel our coverage on Pakistan could use more consistency. While the framing of GV stories attempts to highlight the diversity of Pakistan, this emphasis needs to happen more consistently — inaccurate mainstream media narratives need to challenged. For instance, with the Panama Papers case, there was an opportunity to highlight how a country, often painted as “corrupt and dysfunctional” in western media, closely followed and reacted to a case of high-level corruption. Articles showing how, why, and what this framing of the issue says differently about Pakistan might be a meaningful intervention. All in all, this analysis has encouraged me to think about how I as an editor can best work with our wonderful community of volunteer authors, foster more collaborations within our teams, and encourage a strategic direction for our coverage. I would like to work on these things in the coming weeks. *Note: by analyzing stories mentioning “Pakistan”, this means that we are examining the whole picture of how “Pakistan” is discussed in news coverage. This includes stories beyond an editor’s control. For example, this story mentions the tension between Israel and Pakistan created by ‘fake news’. While it is not about Pakistan, it mentions Pakistan, and therefore words from the article become incorporated as part of Media Cloud analysis.